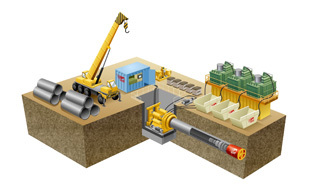 Microtunnelling, or Pipe Jacking Method, is a trenchless solution for constructing small diameter tunnels, used especially for projects that require the tunnel to cross under dense traffic roads, railways, rivers, etc. This technique installs concrete Pipes, by a Pushing or Jacking Frame installed in the Launching Shaft. 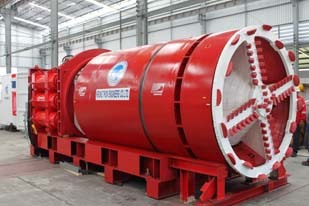 A special Boring Machine or Shield, called the Micro Tunnel Boring Machine (MTBM), is attached to the head of the Pipe that follows the path of the tunnel as it is being bored. TERRATEC MTBMs are suitable for the construction of tunnels with an inner diameter ranging from 500mm up to 2,800mm.